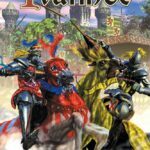 Veteran game author Alex Randolph is known for designs that are usually simple to explain and grasp, seem familiar and yet have enough neat twists to make them unique. 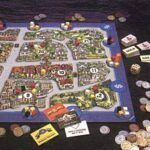 Even though we’ve seen games that, at their core, revolve around placement of cubes on a territorial map and also seen games that utilize auctions to determine placement of said cubes, Big Shot manages to use these basic mechanics to great effect. Big Shot’s board consists of a downtown area, divided into 13 parcels of land or lots. Eleven of them have values (in millions of $ from 9-21) plus 2 parks that each border 3 of the lower valued lots. 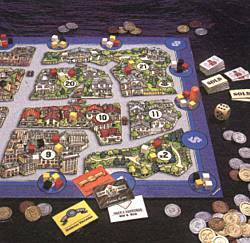 The graphic design is reminiscent of Ravensburger’s classic Scotland Yard and it’s recent updated version, New York Chase. The board’s perimeter consists of 18 round spaces with dollar signs. 72 wooden cubes ( 18 each of 4 colors) are randomly distributed 4 to a space, subject to the constraint that there be at least 2 colors on each space. Players are randomly dealt a rectangular cardboard chipindicating which color they’ll be playing. A wooden pawn is placed arbitrarily on one of the spaces. Each player receives $10 in coins as his starting capital and can take out one $10 loan from the bank per turn. Each turn, the start player rolls a 6-sided die to move the wooden pawn clockwise, skipping over any empty spaces along the way. The 4 colored cubes where the pawn lands are auctioned off as a group. Start player makes the opening bid with each succeeding player, in turn, either raising the bid or passing and dropping out. The high bidder pays the bank in coins and can then place the cubes on any available lots on the board. The only restriction to placement is that no individual lot can have more than 7 cubes. Once a parcel of land has exactly 7 cubes it is scored, with the player that has an undisputed majority receiving the points. If 2 or more players tie for most cubes on a lot, then the player with the remaining cube claims the lot. The acquiring player places a rectangular “sold” marker and one of his cubes on the lot to indicate final ownership. The remaining cubes of all players on the parcel scored are retired from play. The lots adjoining the 2 parks range in value from $9-11 million but can be doubled if a player controls the park as well. The remaining lots have values ranging from $16-21 million. What makes Big Shot especially nasty is the very costly system of loans. Once per auction round a player can request a single $10 million loan from the bank. The first loan nets proceeds of $9 million, with each succeeding loan resulting in the proceeds decreasing by an additional $1 million. The bank, however, expects $10 million at game’s end for each loan taken. This usurious system severely penalizes those prone to overbidding and can result in large negative scores for those lacking fiscal restraint. As in most auction games, there is a ‘point of pain’, beyond which a purchase just doesn’t make economic sense. After the 18th (and final) auction, any lot not already sold is declared to the player with the most cubes on that parcel. Ties, again cancel. Players add up their cash on hand to the value of the lots they control. Loans are then repaid and the player with the most net funds wins. A player is not eligible to win unless he controls at least two parcels of land. The crucial points in Big Shot occur when a given lot has 3 or 4 cubes previously placed. The very next auction will usually result in a bidding war for control of that parcel. Making sure that opponents don’t win auctions too cheaply, whole not overpaying for the cubes you really want usually determine the outcome. The strategic tension is in the bidding and in the placement of the cubes. One breathes a sigh of relief when gaining control of your second property. Big Shot is meant to be played by 4 but can accommodate 3 easily by designating one color as neutral (but getting it’s cubes placed nonetheless). The 2 player version seems convoluted, with each player having 2 colors and keeping funds separate.